Unfortunately, I can’t embed videos on this blog. Don’t really know why. So, here’s a few links to a few short video pieces I’ve done lately. Enjoy. Bad Robot, the production team behind Mission: Impossible – Ghost Protocol released a handy little app called Action Movie and over the Christmas break I had a lot of fun with it with family and friends. See for yourself at the link above! My wife and her friend planned a double date and Skywalk, the new trampoline arena just outside of town, is where we ended up. So friggin’ much fun. I’ve been back twice more since. I was driving to work the other day and the fog was super dense–more dense than what you’ll actually see in this video because it cleared up a bit before I actually pulled out my iPod. This song, “The Devil’s Work” by Miike Snow, came on and the mood was just perfect. I took the video to try to capture that mood. It’s all cars and streets, but I quite like this one. In other news… it’s looking more and more like I’m gonna need to make an author site to have a place more focused on that side of my creative life. This isn’t quite the site people are expecting to find if they come to know me through my prose and memoir stuff. Not really sure what that means for this blog though. There’s an argument to be made that what I post here should be strictly SuperFogeys related, but I know that a lot of you enjoy the other types of blogs. My hope is that, if you’re a fan, you won’t mind going to both places. Anyways, just thinking out loud here. I welcome your thoughts. @ SFX – I loled until I didn’t. Which was only because it was over. @ SkyWalk – Oh my goodness. We need one of these in North Carolina. There’s NOTHING exciting to do here. I think. @ Drive to Work – Fog. Lots of it. Very moody. Very artistic. You really love to sync up music with video. Awesome. When I do home videos/video memories (not that these are them, but I counted the SkyWalk as technically one), I don’t bother so much. I have some sort of OCD compulsion to play the photos and video in the actual chronological order that they were filmed in. Unless it’s a fictional movie, then yeah. The order the script says, not the order it happened in, lol. Your stuff makes me want to try making some more fun vids sometime. 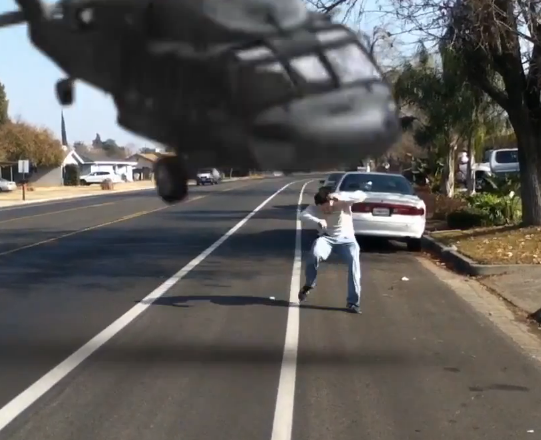 I love that the one photo here is of me dodging a helicopter.